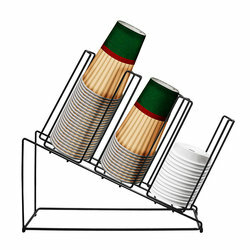 Slanted Cup Rack. A perfect way to organize your cups and lids at the coffee station. These wire racks are available in either a 3 select or 4 select. We have a limited stock on this item. Delivery may be 7-10 days. If you need it sooner, please call so we can let you know if we have it available.